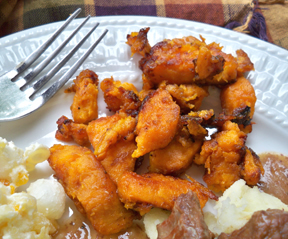 A great way to use left over boiled or roasted potatoes for a tasty side dish. 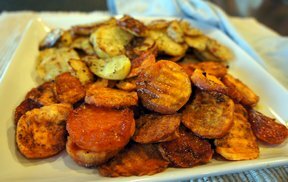 Use left over boiled Yukon Gold or red skinned potatoes* cut into 1 inch square pieces. In a heavy skillet, melt 1 tablespoon or butter and sautÃ© onions for approximately 5 minutes, or until the onions are lightly browned. Add 2 tablespoons of butter and diced potatoes, and stir to mix onions and potatoes. Cook over medium heat until golden brown, approximately 6 to 7 minutes. Flip and cook an additional 6 to 7 minutes until golden brown. *To Boil Potatoes: Scrub potatoes, cutting out any darkened spots. Cut potatoes into quarters. 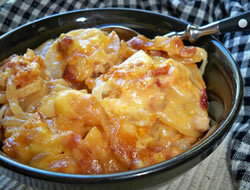 Place potatoes in a large sauce pan filled with enough cold water to completely cover potatoes. Add 1 teaspoon salt, bring to a boil and cook 20 minutes or until tender. Drain. "These potatoes are delicious; however, I would recommend one change with regard to the onions. Add a little oil to the frying pan and saute the onions until they are soft and translucent. If you are making Potatoes O'Brien, add green or red sweet peppers. Set the onions/peppers aside in a bowl. Add the butter to the same pan. 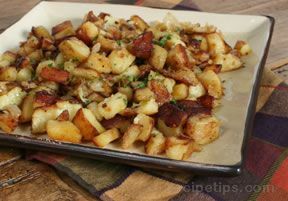 Once it is bubbly, add the potatoes, salt, pepper, and a sprinkling of paprika. Fry until lightly browned. Add back the onion/pepper mix. Cover with a lid, turn down the heat, and continue until the onions are warmed again. Serve. To add a little more flavor, you can also saute a minced garlic clove with the onions or use garlic powder or garlic salt (omit the regular salt). It's all a matter of taste."